This article was originally published on Peak Sports. A game-ending mistake against your biggest rival does NOT define you. Missed opportunities can be bitter pills to swallow. As heartbreaking as a mistake can be in a big competition, that one moment does not tell the truth about who you are as an athlete. This is a difficult concept for many athletes to buy into. The sting of defeat is hard but some athletes agonize when they see themselves as the sole reason for a negative outcome. It is understandable to experience negative emotions after a missed opportunity. You put in a lot of work, dedicate a vast amount of time and make tremendous sacrifices as an athlete to put yourself in position to succeed. Seeing it all slip away can be devastating for some athletes. As hard as it is to accept, you are more than that one moment. You are a hard worker… You are resilient coming back from injury and overcoming mistakes… You are an achiever who has risen to many challenges and improved your game throughout the years. In addition, you are more than just an athlete… You are a person with talents, skills, and positive qualities outside of sport. It may be difficult to wade through the negative thoughts and emotions after missing out on an opportunity but you need to see the big picture if you are to learn from the experience and be motivated to bounce back mentally stronger in the future. Jeffery was a huge reason why the Eagles won the 2018 Super Bowl and also a major contributor to Philadelphia’s 2019 playoff run. Unfortunately, Jeffery dropped a pass that halted the final drive with two minutes remaining in a divisional-round loss to the New Orleans Saints, ending the Eagles chances at repeating as champions. Jeffery was upset in the locker room after the game but understands drops are also a part of the game. Jeffery’s way of dealing with this one moment is an effective strategy to get passed this. –>Feel The Feelings – The disappointment is undeniable and it is normal to experience those negative emotions. –>Take Responsibility – The first step to move on is to take responsibility for your performance. 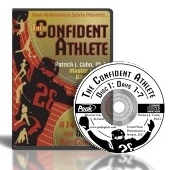 –>Credit Your Successes – If you are going to admit to mistakes, you must also credit yourself for your successes. –>Move On – Let go. After some short amount of time, you will need to move forward. You can’t reach your potential as an athlete if you carry that negative baggage forever. –>Learn – Identify what you can learn from the experience to improve your game in the future. Don’t allow one moment define your role in sports… You are more than that! It is easy to dwell on one missed opportunity but it’s not healthy or beneficial to you as an athlete. Move forward by listing all the things that helped you get to where you are… all the sweat, all the sacrifice, all the extra hours, all the successes, etc. Defining yourself in broader terms will help you develop the mental toughness needed to succeed in the future. And always remember that sports are what you do, not who you are!